You can barely see the burgundy valance over the window. It was coated in dust and was taken down immediately! I absolutely hate this dark sage green paint, and the previous owners used it in the master bath and bedroom, and the half bath in the lower level. It felt so good to prime over it! This makeover is not a WOW or anything, but I think it looks a lot better now. 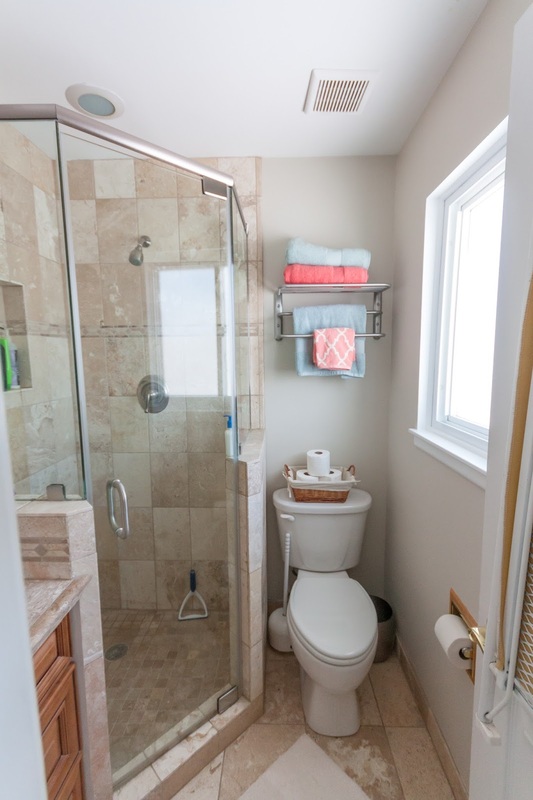 I used BM Natural Cream on the walls, the same color we used in our Minnesota house main bathroom. It is a nice warm gray. I couldn't tolerate painting the walls to match the fleshy/yellow beige of the tile, and there is veining in the tile that matches the wall color, so I think it works ok. The rack above the toilet is from Amazon, it was so easy to install and give us a nice place to stack a couple towels. It was hard to find a towel rack because that little wall is only 24 inches, and most '24 inch' racks are actually almost 26 since the measurement only accounts for the bars. Love Amazon! The window is bare since there is privacy glass, but I may do a little window treatment one day. For now, it's fun to be able to use whatever color towels we want. The ugly wood TP holder is a project for another day! We had to replace the faucet the first week because the existing one's pop up drain assembly wouldn't open and the sink couldn't drain. How that got past inspection, I have no idea...it was seriously like it was super glued down. Replacement drains wouldn't work with the existing faucet because it was all one piece, so an entire new faucet was needed. What an expensive problem! We are finding the previous owners used cheap materials and we are now fixing all their mistakes. 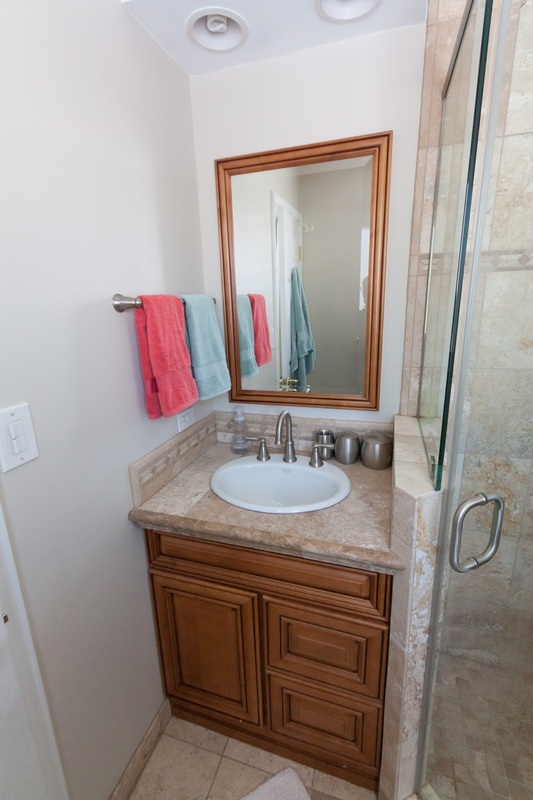 I chose the Moen Banbury faucet and got the matching towel bar since there wasn't one before. I would really like some hardware on the vanity, since you literally have to claw the drawers open, but I can't find anything I like. I feel like satin nickel to match the rest of the bathroom would be too obvious, so I'm thinking dark to match the dark glazing on the wood. 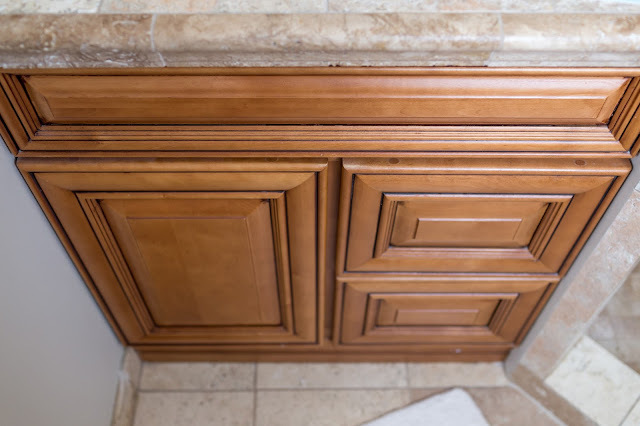 But the fancy edges make placing a knob on the door hard, so maybe a large pull in the middle of the door to match smaller pulls on the drawers? Or, nothing on the door and just pulls on the drawers? Help! Another thing I really need to do is update the can lights. 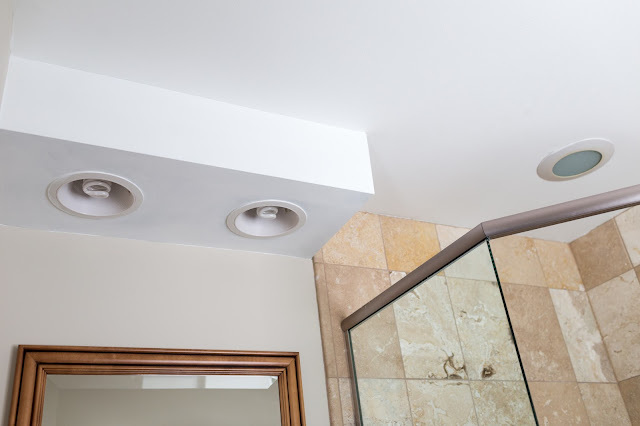 I would love to rip out that dumb soffit and move the box to the wall for a nice normal vanity fixture, but that is just not a priority right now. In the meantime, I will just get new flush can inserts and call it a day. I also fight a daily battle with soap scum on the glass enclosure. I try to squeegee the water off after every shower to prevent this, but that doesn't always happen, or work. I'd love to hear any good methods for keeping the glass clean! So, that is the tiny bathroom we use to shower and (at least for me) basically nothing else. I wish there was more room, but it's nice to have, anyway. Life has been very hard this last month. Zach's face usually looks like this unless he's nursing. He still will not sleep decently unless being held. He usually sleeps for one 2 hour stretch per night in the rock n play (the rest of the night on me) and a single 1-2 hour nap in the swing during the day if I'm lucky. Some days he doesn't really sleep all day long, just little cat naps while nursing. It's so exhausting and it's not just me, he is also super tired. But he won't tolerate a swaddle, he won't take any pacifier I've tried, he won't even take any bottles - so I'm trapped at home with him. He is also so big that it's tiring to wear him in the carrier. He weighed 14 lbs 4 oz at his 2 month check up! This one has a little glimpse of a new rug we got for the living room. The living room is in transition right now since Shaun wanted the sectional downstairs. It's such a mess! There has been some exciting progress on the lower level, I will try to clean that up and take some photos for you all this weekend! First of all, if you track down the plumber on that reno- never use him! That space for the toilet can not be to code- you need at least 30" of space I think... 15" from wall to center of toilet. 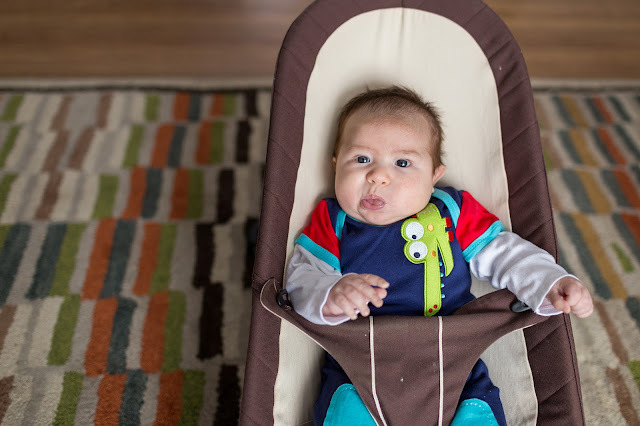 And on the baby front, my son was the same way, and things got better when we started him on reflux medication. It's worth talking to the doctor about if you think that might be a possibility. Good luck, hang in there! Yes, that space is tiny. Not only is the toilet area too small, but the toilet is off center on the wall...that makes me think they put in a larger shower and took area away from the toilet. If things with Zach haven't improved by his next visit, I'm definitely asking about reflux medication. My pediatrician seems to think it's unlikely, but sometimes you just have to try it! 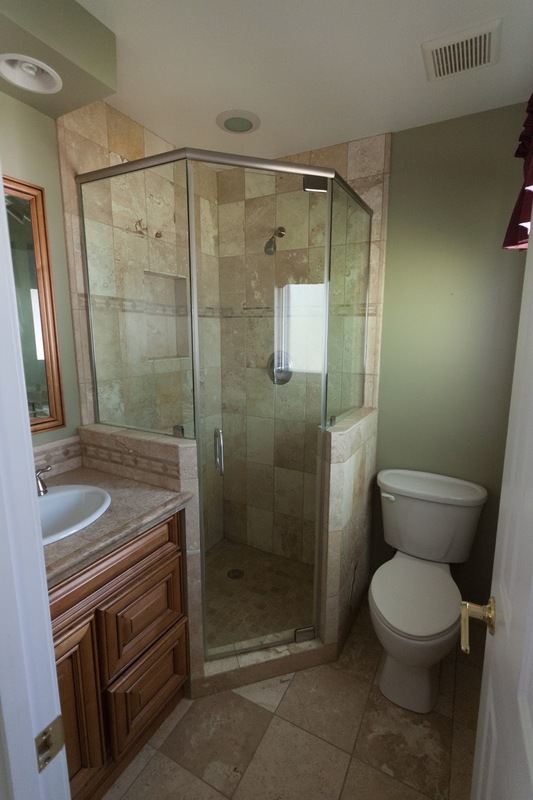 I'd try maybe a water/vinegar mix for the shower glass? Vinegar is a clean-all for me and I love it. I have also heard lemons work for water spots? Never tried it myself though. I cannot believe how big your oldest is getting. 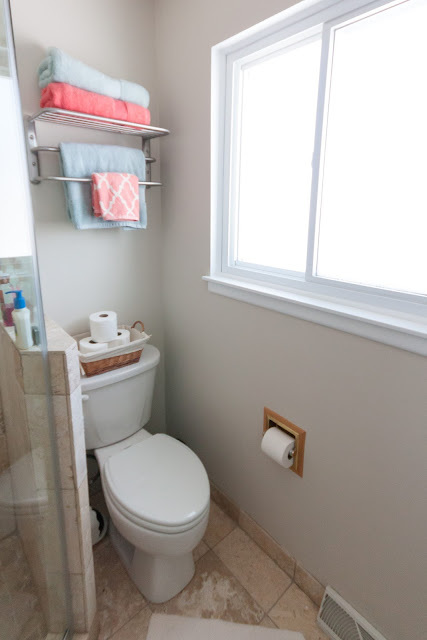 The toilet paper holder, the inverted ones I thought would be a total pain to change out, but we recently did ours, and while I had the hubby do it, he said it was SUPER easy. We switched our out from chrome to brushed nickel and got it from Menards. I am eager to see your next post about the lower level! Love your blog! You've probably already tried this, but gripe water was a life saver for us with our second son. 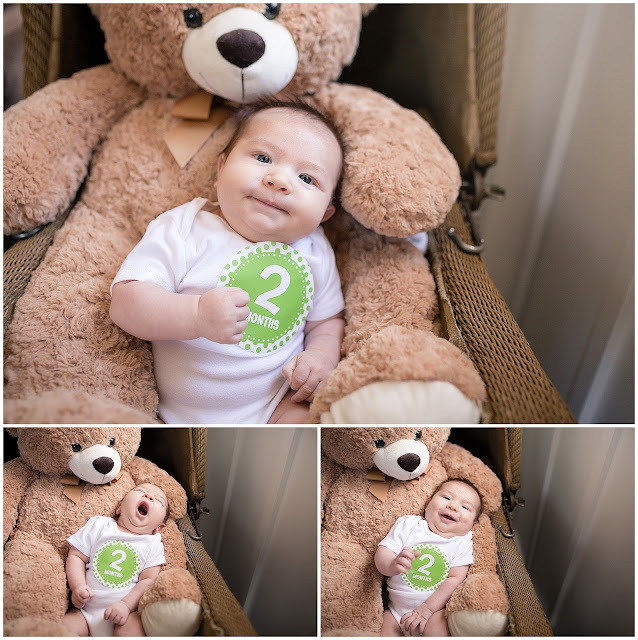 He would wake a few times a night with gas/tummy problems and the gripe really made a difference. My magic trick for the shower glass soap scum is from a girlfriend of mine and I can't believe how well it works: Mr Clean magic eraser. Just the basic one will erase the soap scum. I also use norwex products (they clean only with water) so when there's not a big soap scum buildup I wipe with my cleaning rag and polish with the window cloth and I'm still amazed how well they work. I can remember my second son being somewhat difficult. There was a gas issue and with two small children, I thought I was going nuts! I remember using something from Hylands for the gas (drops for the baby). It did help and I could get more rest, which helped too. It is difficult when you have two operating a different speeds. We will miss the renovations that will have to wait. But you have to rest whenever you can. No magical answers yet. Love the pictures of the boys together! Thank you all! I love how supportive you all are, even when I'm so slow to update. I will be putting your good advice to work today! i second the vinegar mixture!! and your babies and pics are adorable!!! emmy was colicky and cried so much every night... from 6-10 every night. it was misery. inconsolable. i was exhausted emotionally and physically. nothing really helped, but it was over in the matter of maybe a month or so- one day it just ended. The boys are cute! I love the Vday pics! For the shower - Scrub the glass with a mix of baking soda and vinegar and then apply RainX (yeah like the auto glass stuff) to keep water and soap from adhering to the shower doors. You'll have to reapply it every so often but it beats the daily battle! My mom also swears by mop and glo on the shower door for the same effect. Zach is adorable in his baby chubbiness! Your story reminds me of my first: slept only when held and nursed the rest of the time. Totally exhausting! 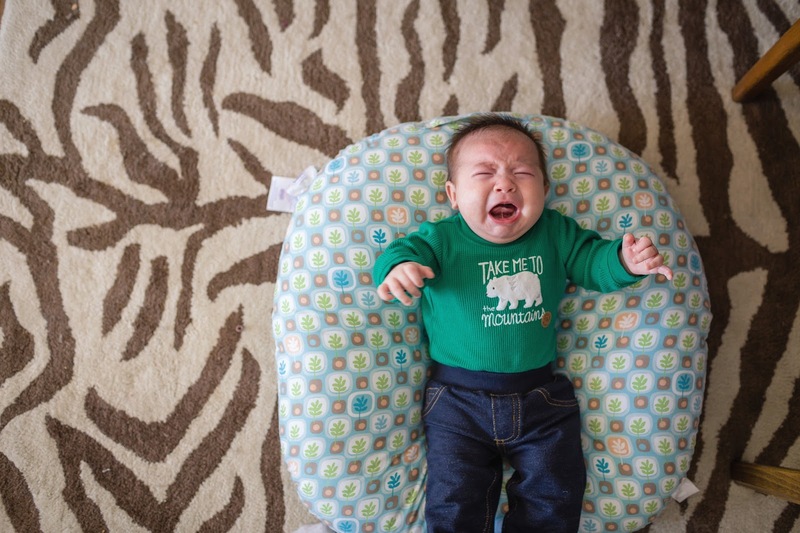 Know that you have a sympathetic community through your blog and we are totally satisfied with pics of that beautiful baby --screaming or calm. 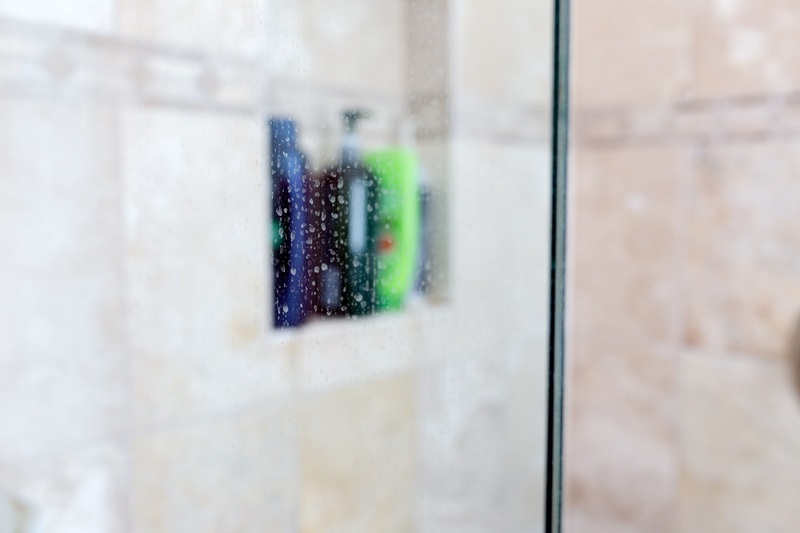 For your glass shower, I highly recommend glass stovetop cleaner and Rain-X. We have the hardest water known to man and this is the only thing I've found that works. (And believe me, I tried all the suggestions here and then some!) I use Bar Keeper's Friend Multipurpose Cooktop Cleaner and I think it's the best one I've tried, but they all do the job. And then apply Rain-X. Since I started using Rain-X and reapplying it regularly, I only start seeing spots every few months. You must be so tired. With my daughter, I would bathe her in lavender scented soap, then lay her on the floor for baby yoga time. Wiggling her legs like a bicycle and a gentle tummy massage helped a lot. As a toddler, I realized that she has a bit of a dairy intolerance. 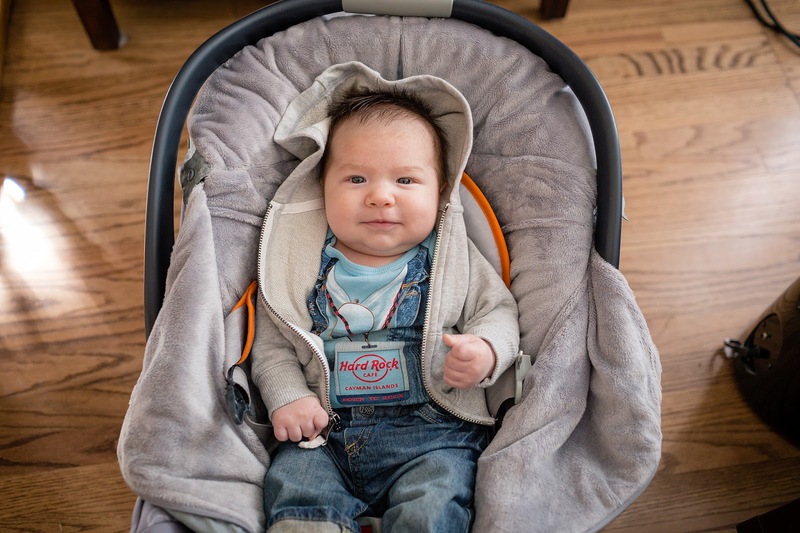 Baby wearing might make you feel more productive. I know you said he's too big for a carrier, but try other ones. I had a beco and it was a lifesaver. 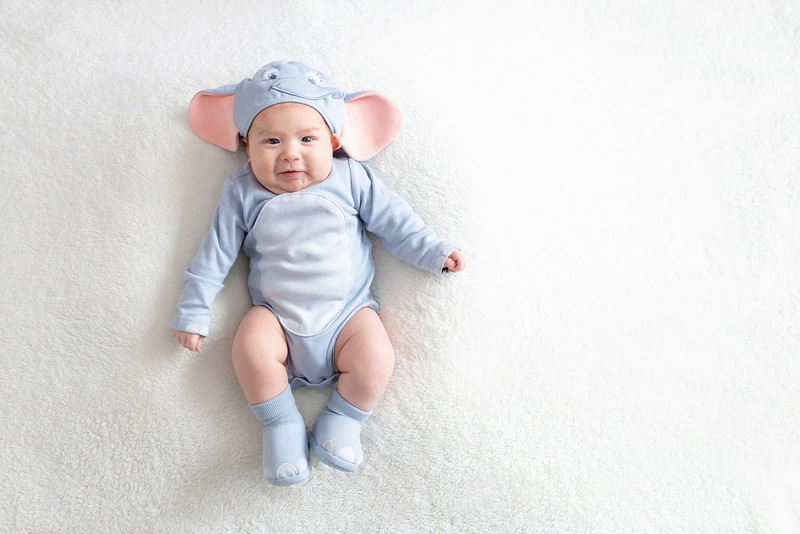 Its worn on the back and you can get infant inserts for it to protect his legs. All of his weight goes on your back. I could even carry my 4 year old if I wanted. I used a maitai sling before that, which was a bit crazier to put on. Being a momma to a new baby is so hard. Hugs to you. It will get easier. Your bathroom looks great already. Love the wall color - it makes everything way more neutral. I hate glass shower doors so much. I can never keep them clean. My mom swears by a squeegee and regular Method after shower sprays. But she's also a clean freak. You guys are the best! I'm going to try the Rain-X for the shower, that is genius. I appreciate all the stories of colicky babies, it does help so much to know that it's not just us suffering, now or in the past! Hey! New reader; I've been reading along from the beginning of the blog toward the present day. I know this is a few months older now, but did you ever get Zachary's tongue looked at? 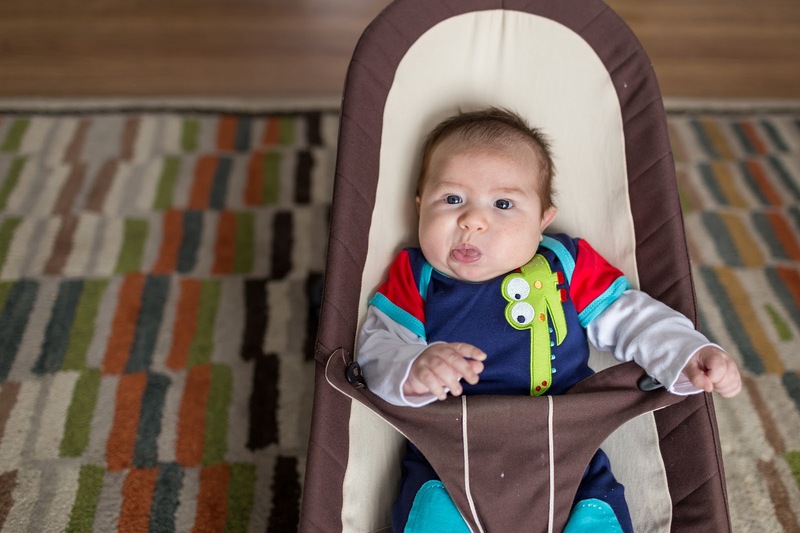 From that first picture, he has at least somewhat of a tongue tie, and that will cause or worsen reflux issues. Your boys are beautiful, and your houses are too! Hi Sabrina! Yes, Zach has a tongue tie. He can stick it out pretty far and never had trouble nursing, so we decided to wait and see with it. Ashford also had a tongue tie, and his has stretched with age. It may have caused some extra crying for Zach, but I guess we'll never know now! So glad to have a new reader, thanks for commenting!